Many Bolivian festivals are a form of religious celebration, expressing a syncretism of paganism and Catholicism. Folkloric dances and music each have their unique costumes, musical instruments and rhythms, and the celebrations may last for days on end, often from early morning to late at night. Some traditional dances from the Andes have spread throughout the country and can be found in many of Bolivia’s large processions, like the Morenada, Diablada and Caporales. How do you recognize folkloric dances like the Morenada, Diablada and Caporal, which are part of festivals such as Carnival, Urkupiña and el Gran Poder? Let’s take a look at the traditional dances in Bolivia. The Caporales is a Bolivian dance that stems from Afro-Andean dances in the Yungas region, such as the Tundiki and Saya. The dance represents the foremen who were in charge of the slaves in colonial times. In the Dance of the Caporales male dancers wear fancy-looking outfits with heeled boots that hold cascabeles, large bells that signify the sound of the chains tied to the ankles of the slaves. In their left hand, they (should) hold a hat and in their right hand a whip. Sometimes women wear similar costumes, however, the majority of female Caporales dancers are dressed in miniskirts and high-heeled boots and wear a round top hat. I love watching the stamina of these dancers. The dance is physically demanding, including lots of jumping, and provokes encouraging cries and clapping from the crowds. 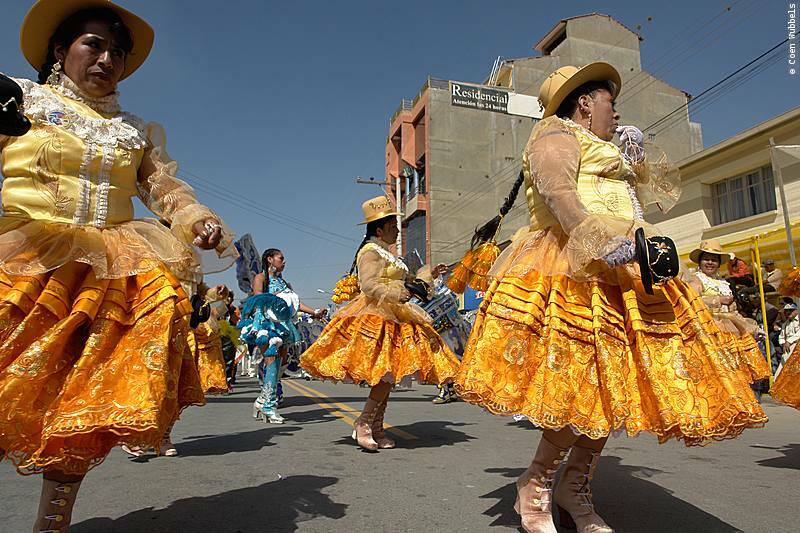 Contrary to most traditional dances in Bolivia, the Dance of the Caporales is a relatively new one: it first made its appearance in La Paz in 1969, during the procession of el Gran Poder. La Morenada is easily recognizable in a procession because it has various characteristics: There are many rattles and drums, groups of women are dressed in polleras (multilayered skirts) with bowler hats, while men wear costumes that supposedly represent barrels and wear silver or black masks (Morenada means ‘black’). 1. The Morenada originated with the African slaves brought to Bolivia to work in the silver mines of Potosí – hence the dark masks with large tongues, which might represent the exhausted mineworkers. 2. The Yungas theory implies that African slaves worked in the Yungas region of La Paz, in the vineyards – hence the barrel-type costume of male dancers. This is the most unlikely theory since the Yungas region never had a wine production; however, Afro-Bolivians did work in other wine producing regions such as Chuquisaca. 3. The origin of the Morenada stems from Lake Titicaca, based on 200/300-year-old cave paintings found there, depicting these dances. This is arguably the most renowned traditional dance of Bolivia and forms the main part of the Oruro Carnival. La Diablada is a fabulous display of heavy, colorful masks and elaborate costumes, and is accompanied by traditional musical instruments from the Andes, such as the zampoña (pan flute) and the quena (a vertical flute). The choreography of La Diablada shows seven movements; however, versions differ per region. The origins of the Diablada are highly disputed among Andes nations since this traditional dance is also performed in Chilean, Peruvian and Ecuadorian celebrations. It is therefore understandable that regional varieties have evolved. The Carnival of Oruro has worldwide fame and obtained a UNESCO status in 2001 as one of the ‘Masterpieces of the Oral and Intangible Heritage of Humanity’. Whether the Dance of the Diablada in Bolivia originated with the Aymaras or the Urus, it is fantastic example of prehispanic traditions mixed with Spanish culture. The Spanish used the dance to evangelize the natives. For example, the missionaries claimed that the dance showed the triumph over the seven deadly sins, and the victory of good over evil, which is represented by dancers wearing costumes of angels and devils. Autoctonous Parade during the Urkupiña Festival. Kallawaya: This is a typical dance from La Paz. Kallawayas are Aymara medicine men. Traditionally the dance was accompanied by wind instruments but nowadays more by band instruments. Tobas: Warrior dancers characterized by their athletic jumps represent the indigenous people who were deported from the lowlands to the altiplano by the Incas to be used as slave labor. Waca-waca (waca tokoris): It’s impossible not to admire this spectacle when seeing how high the shoes are that they dance on! The dance shows a bullfight and is fun to watch. Often one or more of the dancers are dressed up as a bull. Tinku: A dance that originates from Potosí and is traditionally accompanied by charangos ( a type of guitar) and chanting women. This entry was posted in Bolivia Travel, Festivals & Events by Karin-Marijke Vis. Bookmark the permalink.